Program Trace Optimisation (PTO), a highly general optimisation framework, is applied to a range of combinatorial optimisation (COP) problems. It effectively combines “smart” problem-specific constructive heuristics and problem-agnostic metaheuristic search, automatically and implicitly designing problem-appropriate search operators. A weakness is identified in PTO’s operators when applied in conjunction with smart heuristics on COP problems, and an improved method is introduced to address this. To facilitate the comparison of this new method with the original, across problems, a common format for PTO heuristics (known as generators) is demonstrated, mimicking GRASP. This also facilitates comparison of the degree of greediness (the GRASP \(\alpha \) parameter) in the heuristics. 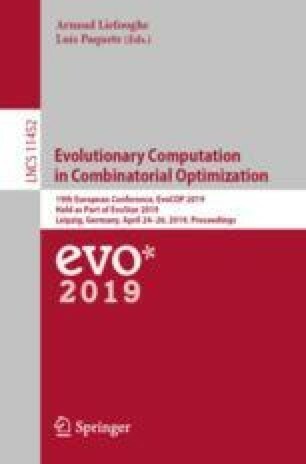 Experiments across problems show that the novel operators consistently outperform the original without any loss of generality or cost in CPU time; hill-climbing is a sufficient metaheuristic; and intermediate levels of greediness are usually best. Thanks to Carlos Fonseca for discussion and to anonymous reviewers. This work was carried out while JMcD was at University College Dublin.